Companies that are growing their earnings are often good investments because they can return a solid profit to investors. According to the discounted cash flow calculator, the following undervalued companies have grown their earnings over a five-year period. 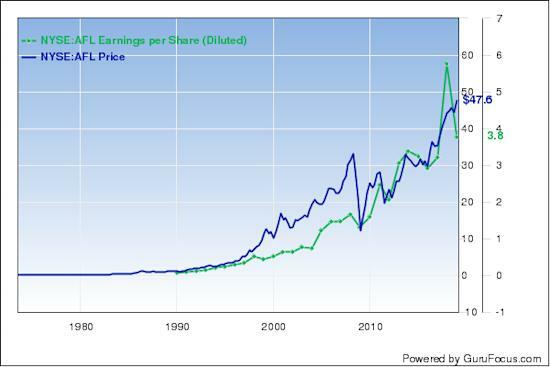 The earnings per share of Apple Inc. (AAPL) have grown 14.30% annually over the last five years. According to the DCF calculator, the stock is undervalued and is trading with a 49% margin of safety at $175.85 per share. The price-earnings ratio is 14.45. The share price has been as high as $233.47 and as low as $142 in the last 52 weeks; it is currently 24.68% below its 52-week high and 23.64% above its 52-week low. The manufacturer of mobile phones, media devices and personal computers has a market cap of $829.18 billion and an enterprise value of $857.48 billion. The company's largest guru shareholder is Warren Buffett (Trades, Portfolio) with 5.29% of outstanding shares, followed by Ken Fisher (Trades, Portfolio) with 0.27%, Pioneer Investments (Trades, Portfolio) with 0.21% and Spiros Segalas (Trades, Portfolio) with 0.14%. Alliance Data Systems Corp.'s (ADS) earnings per share have grown 18.20% per year over the last five years. According to the DCF calculator, the stock is undervalued and is trading with a 60% margin of safety at $172.39 per share. 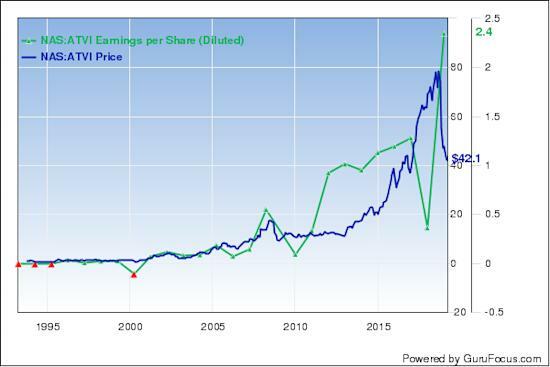 The price-earnings ratio is 9.82. The share price has been as high as $250.27 and as low as $142.58 in the last 52 weeks; it is currently 31.12% below its 52-week high and 20.91% above its 52-week low. The marketing, loyalty and credit card solutions provider has a market cap of $9.14 billion and an enterprise value of $18.66 billion. With 9.56% of outstanding shares, Jeff Ubben (Trades, Portfolio)'s ValueAct Holdings is the company's largest guru shareholder, followed by Glenn Greenberg (Trades, Portfolio) with 3.20%, Ray Dalio (Trades, Portfolio) with 0.92% and Jerome Dodson (Trades, Portfolio) with 0.46%. 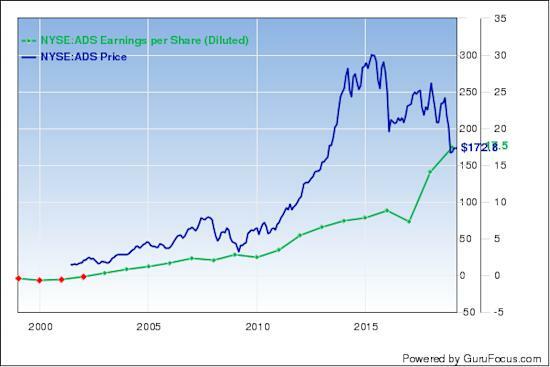 The earnings per share of Aflac Inc. (AFL) have grown 7% per year over the last five years. According to the DCF calculator, the stock is undervalued and is trading with a 20% margin of safety at $49.06 per share. The price-earnings ratio is 13.06. The share price has been as high as $49.71 and as low as $41.45 in the last 52 weeks; it is currently 1.31% below its 52-week high and 18.36% above its 52-week low. The insurance company has a market cap of $36.81 billion. With 0.22% of outstanding shares, John Rogers (Trades, Portfolio) is the company's largest guru shareholder, followed by the Smead Value Fund (Trades, Portfolio) with 0.17% and Pioneer Investments with 0.08%. Grupo Aeroportuario del Sureste SAB de CV's (ASR) earnings per share have grown 21.80% per year over the last five years. According to the DCF calculator, the stock is undervalued with a 32% margin of safety at $164.79. 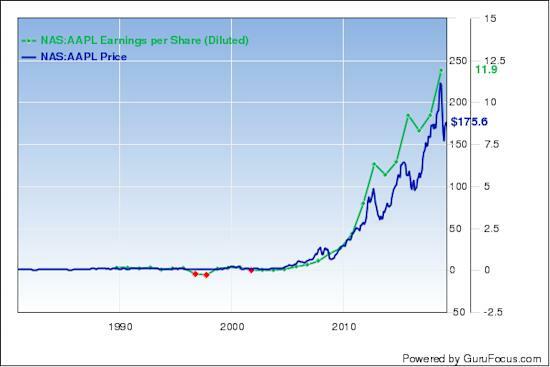 The price-earnings ratio is 19.47. The share price has been as high as $212.70 and as low as $127.95 in the last 52 weeks; it is currently 22.52% below its 52-week high and 28.79% above its 52-week low. The company, which operates nine airports in Mexico, has a market cap of $4.98 billion and an enterprise value of $5.85 billion. The company's largest guru shareholder is Frank Sands (Trades, Portfolio) with 1.23% of outstanding shares, followed by Jim Simons (Trades, Portfolio)' Renaissance Technologies with 0.15%. The earnings per share of ASE Technology Holding Co. Ltd. (ASX) have grown 4.80% per year over the last five years. According to the DCF calculator, the stock is undervalued and is trading with a 34% margin of safety at $4.08 per share. The price-earnings ratio is 10.91. The share price has been as high as $8 and as low as $3.46 in the last 52 weeks; it is currently 49% below its 52-week high and 17.92% above its 52-week low. The provider of semiconductor packaging and testing services has a market cap of $8.63 billion and an enterprise value of $13.42 billion. The largest guru shareholder of the company is Fisher with 1.84% of outstanding shares, followed by Simons' firm with 0.95%. 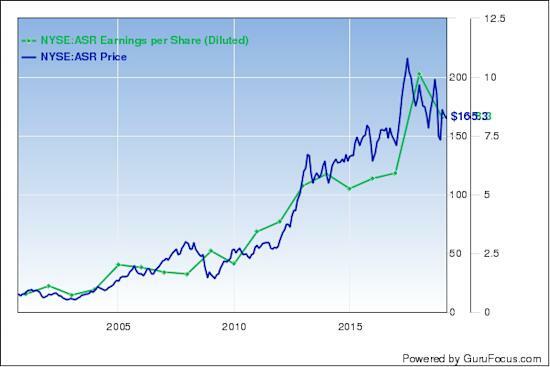 Activision Blizzard Inc.'s (ATVI) earnings per share have grown 3.40% per year over the last five years. According to the DCF calculator, the stock is overpriced by 25% at $41.79 per share. 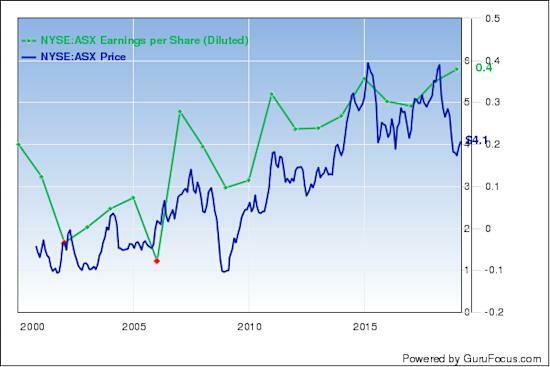 The price-earnings ratio is 17.78. The share price has been as high as $84.68 and as low as $39.85 in the last 52 weeks; it is currently 50.65% below its 52-week high and 4.87% above its 52-week low. The video game developer has a market cap of $31.68 billion and an enterprise value of $30.37 billion. With 2.05% of outstanding shares, Steve Mandel (Trades, Portfolio) is the company's largest guru shareholder, followed by Philippe Laffont (Trades, Portfolio) with 1.18%.